Too often as sports enthusiasts we focus on what makes a coach, or a lesson, “great.” Maybe it was the fitness portion. We had a high intensity workout, our heartrate was up and we were sore the next day. It could be something that was said, or demonstrated in the lesson that “clicked,” allowing us to better execute a shot. We had a moment, where in all the times before, we couldn’t fully realize what our coach meant, but in this instance it all came together. And it’s in these times that we shouldn’t be looking outward to our coach, but back on ourselves, and see what we can do as students to make their job of teaching more beneficial for both parties. 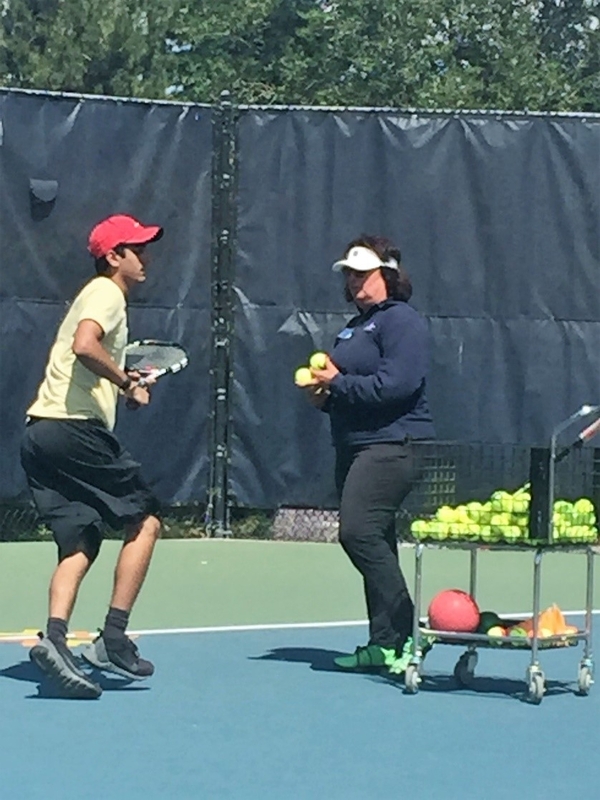 Rosie Bareis, one of four USPTA Master Professionals in Northern California, leads a Coaches Clinic at Caughlin Athletic Club in August 2016. Probably the most fundamental thing to know before we step out on the court is why are we playing tennis? What are we hoping to gain? The answer should be target specific. “I want to get better” isn’t clear enough. Better at what? Better than who? Being able to tell your coach detailed expectations, allows your pro to focus on results relating to your desired goal. As adults, there is no shame in admitting that your hope is strictly to get out and play socially. Not every tennis dream has to land you in the finals of Wimbledon. As a junior, letting your coach know the reason you’re playing tennis will help them in structuring lessons and programs. The way a 60 minute, or two hour session, will go is based largely on what the pro knows about why you’re holding a racquet. The way the instructor instructs is different for, “I want to hang out with my friends,” “I want to play in high school,” or “I want to play tournaments, and compete at a collegiate level.” In turn, having a mutual understanding, will avoid frustration from your coach as they expect top 100 in the world results, from a student who’s just looking to make the varsity team. What kind of learner are you? Are you visual? Auditory? Kinesthetic? Exasperation can be a two way street when, as a student, you’re just “not getting” what your coach means. Perhaps their teaching methodology isn’t allowing you to fully realize what they are trying to instruct. In return, if your teacher doesn’t know what learning style works best for you, they may feel annoyed that you’re not paying attention, or simply “not trying.” Chances are you haven’t thought about the way in which you learn quickest, but don’t underestimate its importance in order for you, and your coach, to bring out the best in each other. Finally, there needs to be a commitment from the student. Much like doing homework in school, there has to be a contract, of sorts, that you plan on completing. Simply showing up for your lesson, once a week, but never working on the lesson objectives at any other time, is doing you, and your coach, a huge disservice. Tennis is more than simply hitting a ball. There is a cardio component, a fitness aspect, mental challenges, in addition to the actual strokes. In order to realize your goal, you have to be willing to work on all the aforementioned areas. Too often, it’s easier to blame the pro for a lack of results, than to turn the mirror on ourselves and see what contributions we are making as earnest, willing students of the game. In essence, ask not what your tennis coach can do for you, ask what you can do for your tennis coach. We hope this post motivates you to communicate more with the coaches in your life. We appreciate you, and if you enjoyed this post, subscribe to our email list by clicking the green button below, where we share tennis tips and tennis happenings with you. You can add to the discussion by sharing any thoughts you have about the relationship between the student and the coach in the comment section below.